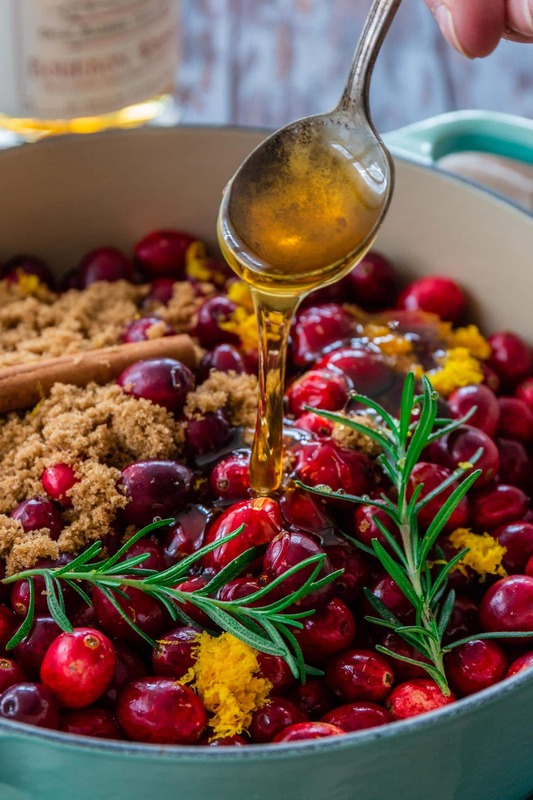 This Honey Bourbon Cranberry Sauce might steal the show this Thanksgiving! Sweet, tart, chunky and so easy to make. You will never buy the canned stuff again! I know this is a bit last minute, but I just couldn’t forgive myself if I didn’t share this amazing cranberry sauce with you. Homemade cranberry sauce is non-negotiable to me! In fact, I was shocked to read this article from Food & Wine where some chefs said they prefer canned over homemade. Apparently, some people even love the way it looks out of the can, with the imprinted can lines and all! I understand that can be an emotional subject and that the canned stuff brings some people right back to their childhood. Well, I come from a country where things rarely come from a can and holiday meals are cooked from scratch! Hence my perplexity to find out that canned cranberry sauce has such a big legion of fans. If you, like me, are #teamhomemade, this post is for you! 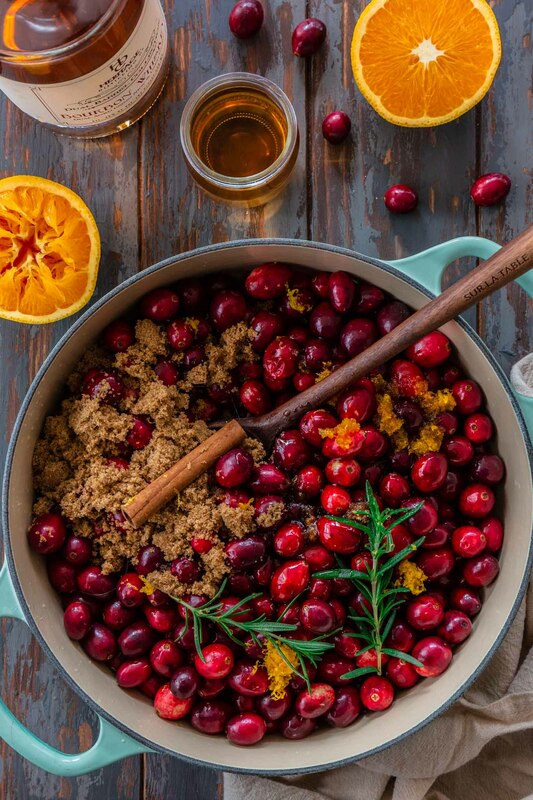 And it’s not your ordinary cranberry sauce. Oh no, it’s so much better! It involves honey and bourbon. And in my dictionary, those two things make anything better! 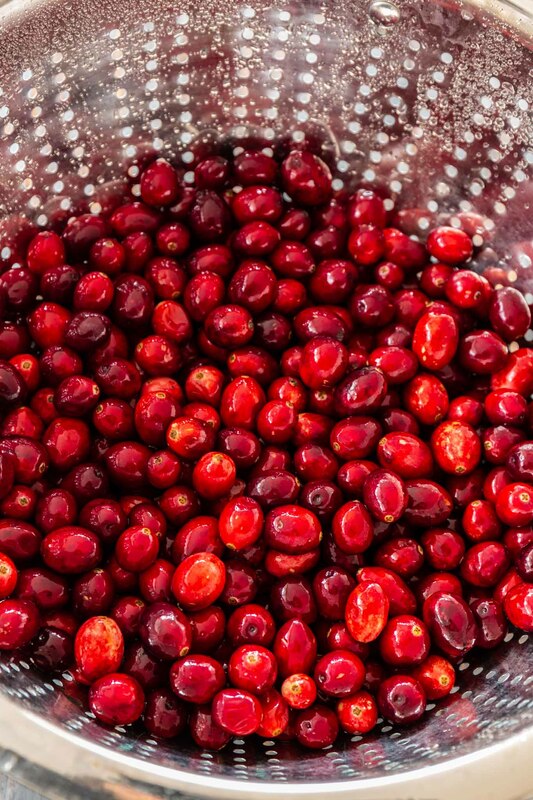 Making cranberry sauce couldn’t be easier! It takes less than 15 minutes and all you gotta do is combine all the ingredients in a pot and simmer until the berries burst. Chances are when that happens, most of the liquid will be gone and the sauce will be chunky and thick! But if it’s not, you can continue cooking for a little bit until it does. Just be aware that the sauce will thicken further as it cools. If you like your sauce smooth, you can use a potato masher or even transfer the (cooled) sauce to a food processor and pulse a few times for the desired consistency. And if you prefer a sweeter sauce, you could always add more honey at the end. I find that the sweetness enhances as the sauce chills in the fridge, so I try not to overdo it! After all, we don’t want to lose that bit of tartness that makes cranberry sauce pair so well with the turkey. As for serving, I like it at room temperature. But I always chill it in the fridge for at least 2 hours for the flavors to enhance! 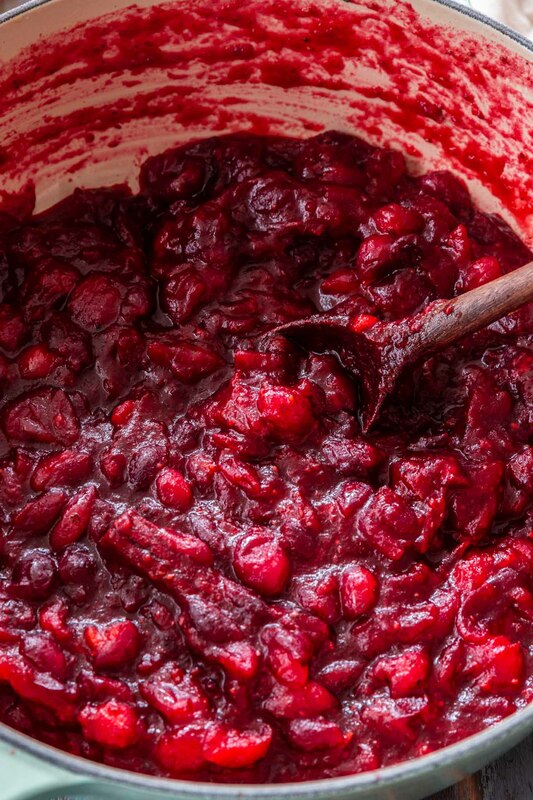 Can I make Honey Bourbon Cranberry Sauce ahead of time? Absolutely! Since it contains quite a bit of sugar, cranberry sauce can be made up to a week in advance and stored in the fridge in an airtight container. You can also make it a couple months ahead and freeze it until Thanksgiving. But it’s so quick and easy to make that I’ve never seen the point of doing that. Unless we are talking about leftovers! Then I’m totally on board! There’s something about buying fresh cranberries that puts me in the mood for the holiday season! However, if you left your shopping to the last minute and they are all gone (Happened to me once! ), or if you happen to have frozen cranberries on hand, you can absolutely use that instead. It really doesn’t matter if you’re using fresh or frozen, since we’re going to be cooking them. And the best thing is that you don’t even need to thaw them! Just use them as you would use fresh ones. If you are lucky to have leftovers, there is a world of possibilities on what you could make with them! Use it as jam. Spread it on toast, pancakes, waffles, peanut butter and jelly sandwiches. Pour it over oatmeal or porridge. Add to yogurt or ice cream. Use as a glaze for poultry or pork. Meatballs also go great with cranberry sauce! Make cranberry butter or cranberry cream cheese. Add it to a cocktail. Add it to baked goods or as a topping for cheesecake. Or, ya know, make the classic leftover sandwich with turkey. You can never go wrong with that! Combine all the ingredients in a pot, over medium heat. Once boiling, lower the heat and simmer until the cranberries burst, about 10 minutes. Continue cooking until the desired thickness. The sauce will thicken further as it cools! Remove from heat and taste to see if it's too tart. If yes, you can adjust by adding more honey to taste. Remove the rosemary sprigs and cinnamon stick, and let it cool completely. Then, transfer to an airtight container and refrigerate for at least 2 hours or up to a week! Serve chilled, reheated or at room temperature.